People celebrate the special occasions in their own style. Yesterday, I was wondering how to make our anniversary special today! 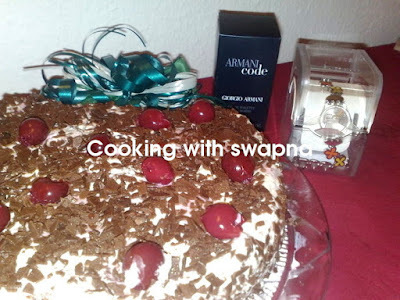 Finally, I decided to gift him Armani code perfume which adds his armani collections & bake his fav black forest cake with cherries on top. Fortunately, my bake turns great & taste yummy. It was 12'o clock sharp this morning, I gave him a surprise under a candle light, mouthwatering black forest cake & the gift. Equally, he surprised me with swatch watch which look georgeous. Black forest cake is a chocolate layer cake with Kirsch, whipped cream, sour cherries and chocolate curls. 1 can (21 oz.) cherry pie filling, chilled. Cream butter and sugar together. Add eggs, flour, milk, baking soda, cocoa and vanilla. Blend on low, scraping constantly. Beat 3 minutes on high speed. Pour into two 9 inch round cake pans that have been greased and floured. Bake at 350° for 30-35 minutes. Cool thoroughly. Whip heavy cream with confectioners' sugar. Slice each cake round horizontally to make four layers. Place one layer on flat plate. Fill pastry bag with whipped cream and pipe a generous ring around edge of cake layer. Fill exposed ring of cake with cherry pie filling. Place third layer on top, and frost entire cake with whipped cream. Crumble the fourth layer into fine crumbs and sprinkle on sides of cake. 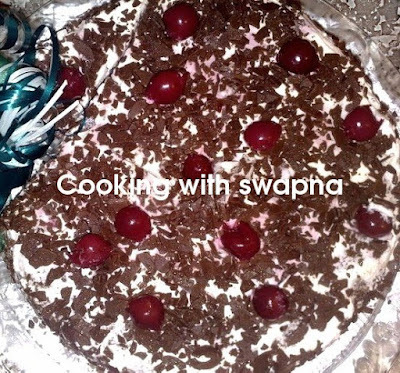 Garnish the top of cake with the chocolate crumbs & cherries. join with us in the efm-microwave oven series and check out the round up of efm savory seris! 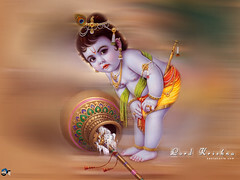 hi first time here..thanks for following me n btw black forest is my fav! Looks good and guess so will be the taste.